I'm going to be honest, I have no idea where the inspiration for this week's mani came from. Haha! I knew I wanted to use Man Hunt because it's such a pretty blue, and I knew I'd need some sparkle, hence Dorothy Who?, and the rest just kind of happened. For some reason, Man Hunt photographed WAY lighter than it is in real life. You've been warned. I love the overall look and it was nice to make use of my longer nails (that have just recently come back, yay!). The anchor is a sticker from the same kit my chevron stickers came from and it only took two coats of top coat to cover the ridges. I'm obsessed with anchors and anything that has to do with the ocean for that matter. Well except boats, I just don't care. Anyways, I love your nails :) I've come to the conclusion that I can't do nail designs because my nails are too short, not allowing any room ;). Whaaaat, the color in the bottle looks totally different than the color on your nails! That's wild. Love the little anchor - I'm going to use mine soon too to recreate a nail version of an awesome outfit I saw on someone's fashion blog! Very cute! I tried to do nautical nails once... your anchor turned out much better than mine! Haha, I'm glad I got you in a singing mood! I had to- it's cheesy- but with that being the name of the nail polish- I just couldn't pass up that opportunity! Haha! Thanks love the blue by the way! Have you found your perfect creme/taupe yet? I just saw another one by NYC and totally thought of you! Wow such a gorgeous navy mani! I love it. I'm LOVING the anchor and shades of blue! Too pretty. I love blue and white together, so classic and crisp! Oh I LIKE it! I wish my nails were long enough to do that kind of edging work. I'm amazed you got a steady, straight line with the white. Well done! Oh I LOVE anything nautical. That navy blue is divine! Your lines are perfect!! I'm no good at French tips since I don't have square nails. I love these with the glitter at the tips. I love the French Tips... and that anchor was so cute! I absolutely love your nails! Too colors and designs too! 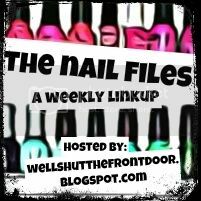 I always look forward to your nail link ups:) Enjoy your evening! OMG when I first saw the anchor I totally thought you did that freehand - and I wasn't surprised in the slightest!